BeachyRustica is currently away. Click Here for more information. 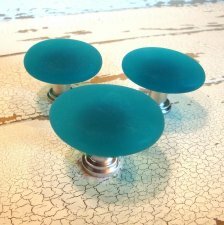 Freeform, organic shaped glass cabinet knobs bring a touch of the shore to smaller places and add a fun, beachy feel to your cabinets and furniture. 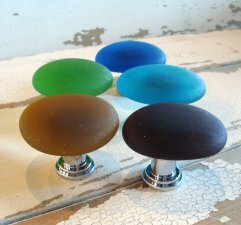 Each cabinet knob / drawer pull is made from an approximately 1 1/2" piece of frosted "beach" glass (although this is not "found" glass). Each piece has been frosted and has smooth, rounded edges. The glass is then permanently affixed to cabinet hardware. The hardware piece has a satin nickel finish, and includes a standard 8-32 threaded 1" screw. Colors are currently limited to those shown, please also see http://bit.ly/BeachGlassColorGuide or inquire. Price is per piece. Please specify color choice in Note to Seller during checkout. If no color is specified, Teal will be shipped. I accept credit cards via Paypal. You can use Paypal to purchase even if you don't have a paypal account. Please contact me if you have any payment issues. I ship first class or priority, and use delivery confirmation to make sure packages don't go astray. 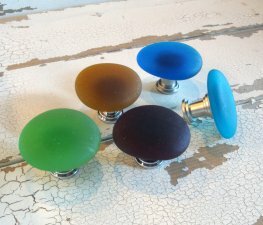 Whenever possible I use recycled shipping materials, so that used looking box that shows up at your house just may contain some fabulous cabinet knobs! We're not happy if you're not happy! Please contact us if your purchase is not up to your expectations.